Paula’s rise to stardom was underway but when she premiered “Paula’s Home Cooking” on the Food Network in 2002, she was on the verge of superstardom. The network added “Paula’s Party” in 2006 and Bobby and Jamie began making appearances with Paula on the programs. The family that began delivering lunch-and-love-in-a-bag in 1989 had become one of the most recognized and beloved families in the country. The Food Network gave Bobby and Jamie their own show, “Road Tasted,” and today Paula has two shows running on the network, “Paula’s Best Dishes,” which debuted in 2008 and the long running “Paula’s Home Cooking.” Paula is a two-time Emmy Award winner. Now the author of 14 cookbooks which have sold more than 8,000,000 copies, she began her bimonthly magazine, Cooking with Paula Deen, which has a circulation of more than 1,000,000 today. 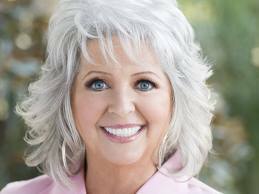 Paula Deen, adored by millions of fans, is seemingly everywhere in American media and culture. In addition to her own television shows, she appears regularly and has visited virtually every network morning show, every daytime or late night talk show, has appeared in hundreds of newspaper and magazine articles and thousands of websites. Paula’s vivacious energy combined with a dazzling smile and infectious laugh is like America’s best friend and next door neighbor. When Paula tours the country making personal appearance to talk about life, family and cooking, thousands of people come to participate. On New Year’s Day 2011, Paula was the Grand Marshall of the Tournament of Roses Parade. Buy her latest cookbook - Paula Deen's Southern Cooking Bible at www.thequalitycorner.com. Paula Deen recently released a new cookbook. At this time of year, many people are cooking and baking more frequently. I certainly am. I have baked brownies, pecan pie, pumpkin pie, bread pudding and zucchini bread in the past few weeks. I can hardly believe it! We've had dessert every evening. This new cookbook is right on time. I love Paula Deen's cooking show. She is a woman after my own heart. I love to cook and I love butter! For those who love cooking, the Paula Deen's Southern Cooking Bible (2011) provides a huge recipe collection of southern meals and hospitality. The various recipes framed in this regional cuisine book illustrate the diversity and originality of southern cuisine. Major highlights in this recipe book by Paula Deen include gumbos and collards; barbecues and pies; etc. This regional cuisine book also features 100 “how-to” illustrations that demonstrate techniques to peel a shrimp; to make sweet potato balls without getting marshmallow all over your hands and more. The vibrant, colorful photos included in this recipe book by Paula Deen make the cookery book more engaging and appealing. The Paula Deen's Southern Cooking Bible (2011) has been dialectically structured and starts with hot and cold appetizers and ends with cakes, cookies, and pies. I’ve been cooking and eating Southern food my whole life, and I can tell you that every meal you make from this book will be a mouthful of our one-of-a-kind spirit and traditions. These recipes showcase the diversity and ingenuity of Southern cuisine, from Cajun to Low-Country and beyond, highlighting the deep cultural richness of our gumbos and collards, our barbecues and pies. You may remember a few beloved classics from The Lady & Sons, but nearly all of these recipes are brand-new—and I think you’ll find that they are all mouthwateringly delicious. It is, without a doubt, a true Southern cooking bible. I sincerely hope that this book will take its place in your kitchen for many years to come, as I know it will in mine. Here’s to happy cooking—and the best part, happy eating, y’all! New Book by Shaquille O'Neal - "Shaq Uncut: My Story"
"Superman. Diesel. The Big Aristotle. Shaq Fu. The Big Daddy. The Big Shaqtus. Wilt Chamberneezy. The Real Deal. The Big Shamrock. Shaq. You know him by any number of names, and chances are you know all about his legendary basketball career: Shaquille "Shaq" O'Neal is a four-time NBA champion and a three-time NBA Finals MVP. After being an All-American at Louisiana State University, he was the overall number one draft pick in the NBA in 1992. In his 19-year career, Shaq racked up 28,596 career points (including 5,935 free throws! ), 13,099 rebounds, 3,026 assists, 2,732 blocks, and 15 All-Star appearances. These are statistics that are almost as massive as the man himself. His presence - both physically and psychologically - made him a dominant force in the game for two decades. But if you follow the game, you also know that there's a lot more to Shaquille O'Neal than just basketball. Shaq is famous for his playful, and at times, provocative personality. He is, literally, outsize in both scale and persona. Whether rapping on any of his five albums, challenging celebrities on his hit television show "Shaq Vs.," studying for his PhD or serving as a reserve police officer, there's no question that Shaq has led a unique and multi-dimensional life. And in this rollicking new autobiography, Shaq discusses his remarkable journey, including his candid thoughts on teammates and coaches like Kobe Bryant, Dwyane Wade, LeBron James, Phil Jackson, and Pat Riley. From growing up in difficult circumstances and getting cut from his high school basketball team to his larger-than-life basketball career, Shaq lays it all out in SHAQ UNCUT: MY STORY. " Purchase Shaq Uncut at www.thequalitycorner.com in print or audio. View photos of Robin Robert's interview with Shaq on GMA. "Common has earned a reputation in the hip hop world as a conscious artist by embracing themes of love and struggle in his songs, and by sharing his own search for knowledge with his listeners. His journey toward understanding--expressed in his music and now in his roles in film and television--is rooted in his relationship with a remarkable woman, his mother, Mahalia Ann Hines. In "One Day It'll All Make Sense," Common holds nothing back. He tells what it was like for a boy with big dreams growing up on the South Side of Chicago. He reveals how he almost quit rapping after his first album, "Can I Borrow a Dollar?," sold only two thousand copies. He recounts his rise to stardom, giving a behind-the-scenes look into the recording studios, concerts, movie sets, and after-parties of a hip-hop celebrity and movie star. He reflects on his controversial invitation to perform at the White House, a story that grabbed international headlines. And he talks about the challenges of balancing fame, love, and fatherhood. "One Day It'll All Make Sense" is a gripping memoir, both provocative and funny. Common shares never-before-told stories about his encounters with everyone from Tupac to Biggie, Ice Cube to Lauryn Hill, Barack Obama to Nelson Mandela. Drawing upon his own lyrics for inspiration, he invites the reader to go behind the spotlight to see him as he really is--not just as Common but as Lonnie Rashid Lynn. Each chapter begins with a letter from Common addressed to an important person in his life--from his daughter to his close friend and collaborator Kanye West, from his former love Erykah Badu to you, the reader. Through it all, Common emerges as a man in full. Rapper. Actor. Activist. But also father, son, and friend. Common's story offers a living example of how, no matter what you've gone through, one day it'll all make sense." Purchase "One Day It'll All Make Sense" at www.thequalitycorner.com. Centuries ago a wise king stated, “Man has dominated man to his injury.” Innocent people suffer at the hand of greedy businessmen. Bad things happen to good people. These are facts we must all face daily. Sufferers take comfort in knowing that justice will prevail in the end. 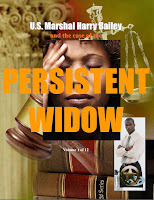 This age-old tale of good versus evil sets the stage for Larry Montgomery’s debut novel, US Marshal Harry Bailey and the Case of the Persistent Widow. The main character, Harry Bailey, is a US Marshal returning from a tour of duty in Iraq. He has been injured and he is now on medical leave. The doctor sends Bailey to a home in New York where he can receive supervised care. While recuperating, Bailey unwittingly becomes involved in a devious plot. To Marshal Bailey’s surprise, he is living across the street from the pregnant widow of a fellow soldier. He watches her endure unspeakable tragedy. She has lost dear loved ones in death and now she is left alone to deal with a dubious landlord. Her landlord is trying to force her out of the building and she is determined to remain in her home. Instead of taking time to grieve for her loved ones and prepare for a new baby, she is forced into a long court battle. Despite her circumstances, she is persistent in her fight. The plot thickens as the landlord’s motives are slowly unveiled. Marshal Bailey steps in to help. As he investigates, he finds out the enormity of the situation. He is determined to assist this widow and make sure that the wrongdoers are brought to justice. 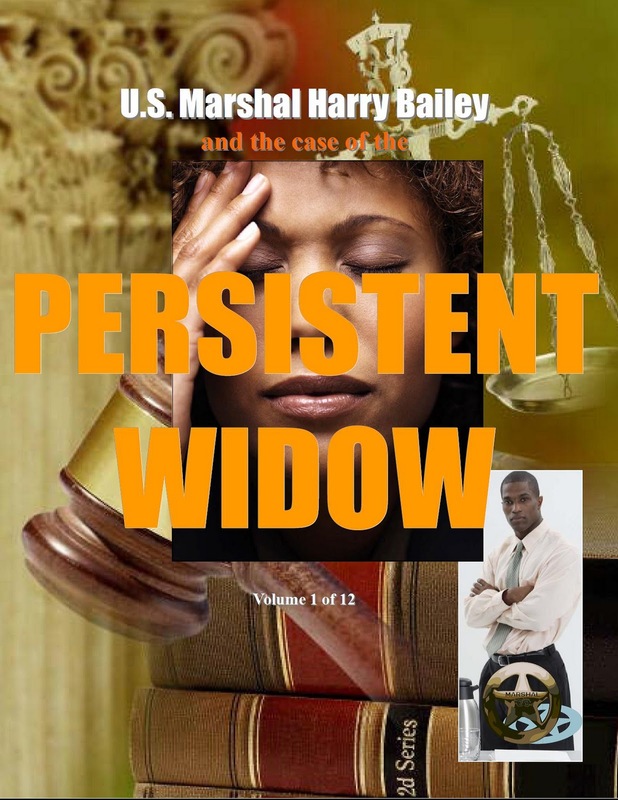 US Marshal Harry Bailey and the Case of the Persistent Widow is a very entertaining story. It is full of drama and suspense. Larry Montgomery does an excellent job of vividly describing each character and location. I could easily envision the story with my mind’s eye. Montgomery captivates the reader with an interesting storyline. He keeps the reader engaged throughout the story with unexpected turns at every corner. This is the kind of book that can keep a reader up all night to find out the ending. This novel is the first in a series of twelve featuring US Marshal Bailey. It is the author’s hope that the reader will “find a few moments of relaxation from reading this book and that you look forward to reading the complete, twelve book series.” I certainly found relaxation, entertainment and enjoyment from reading the first book in this series and I eagerly anticipate the books to come. I would love to see this story made into a movie. I am confident that all who read this book will enjoy it as much as I did.